This entry is a continuation of a series on breweries in Brooklyn and Queens. 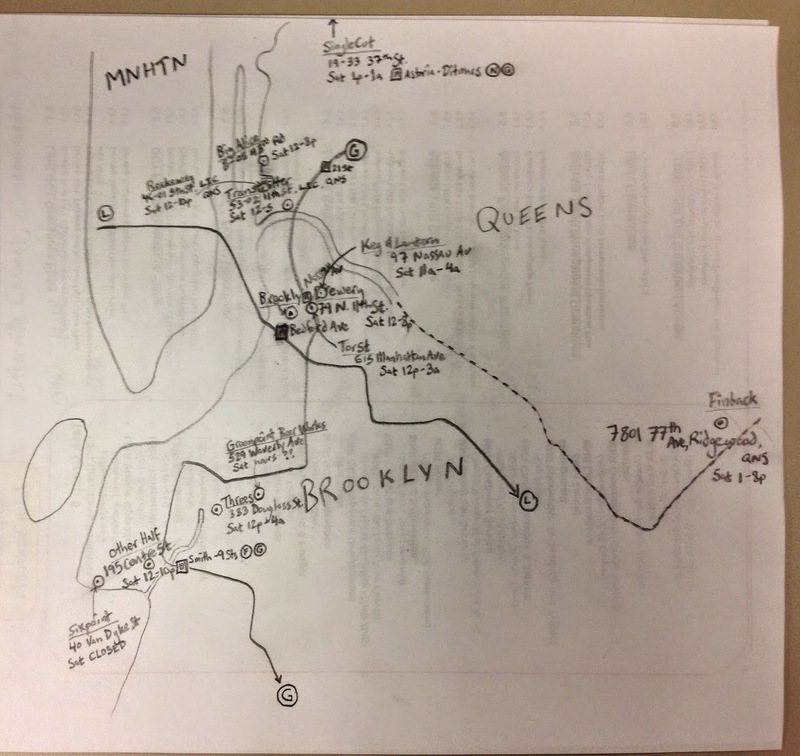 You can download my hand-drawn brewery tour map here and follow along. Inspired by a meeting of the New York Homebrewers Guild (every third Tuesday at Burp Castle, 41 E 7th St, New York, NY), this trip, an attempt to visit all the micro- and nanobreweries within New York City has stretched over the course of four weekends and counting. SingleCut Beersmiths (website, 19-33 37th St., Astoria, Queens), is a short hike from the last stop on the N/Q at Astoria-Ditmars and the famous Bohemian Beer Hall (website, 2919 24th Ave, Astoria, Queens) and well worth the walk. By New York standards, it feels like the end of the earth, since the area is surrounded by grass and not far from a power plant and LaGuardia Airport, though the building itself feels new, open to the good weather, and overall an inviting place to have a few beers. Their bar area is stocked with free board and card games and they keep classic vinyl on the turntable. The beer does not disappoint either. At the time of our visit in May the beer lineup included, most memorably, both the Hibiscus and Tart Cherry Sour Lagrrr! and the piney hopped Dean PNW Mahogany Ale. Their beers tended towards the light and drinkable, with a few hop-bombs thrown in for good measure, such as the latter beer mentioned above. Their brews can be found across the city as well, including at one of my favorites, Drop-Off Service (Yelp, 211 Avenue A, Manhattan), home of the $3 ’til 8pm craft beer happy hour. LIC Beer Project (website, 39-28 23rd St., Long Island City, Queens), is a small brewery space tucked in between the auto repair and warehouses of Long Island City. Their small selection was heavy on saisons at the time, which I usually prefer in a bottle and aged to smooth out the bite. Their WonderLIC Belgian pale ale, however, was a great treat, full of floral dry-hoppiness and not too heavy on the bitter or the alcohol. Worth a trip if you’re in the neighborhood or if they’re unveiling a big beer. All in all, the last in a series of quality offerings in between the skyscrapers going up in LIC. Enter your email and you'll be the first to know about new articles and other timely travel info.